As the demand for plasmid DNA (pDNA)–based gene therapy and vaccines increases, large-scale, cost-effective, and reproducible pDNA production will be required. The key to success is a real-time, in-process control method that ensures a high percentage of supercoiled pDNA in the final product. 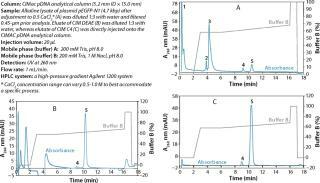 CIMac pDNA Analytical Column allows the monitoring of degradation products (open circular and linear pDNA), the removal of impurities (RNA), and the assurance that each production step is yielding the amount of supercoiled pDNA anticipated. 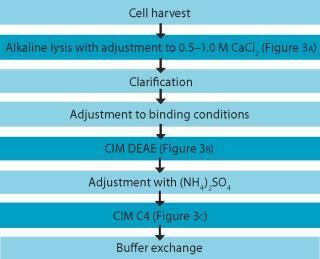 An example of a pDNA purification processs (Figure 1) based on our CIM HIP2 Plasmid Process Pack (for details please check the product brochure or visit our website) with in-process control steps is shown in Figure 3. 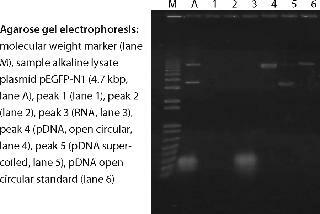 The final product composition is confirmed by agarose gel electrophoresis (Figure 2). 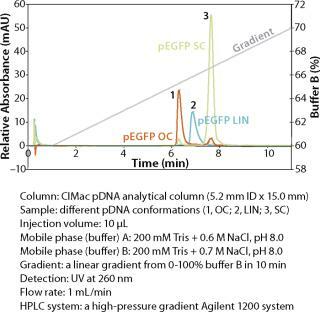 In Figure 4, the complete separation of all three pDNA conformations from a test solution within 10 minutes on the CIMac pDNA Analytical Column (Figure 2) shows the versatility of the column (photo). When used as part of a complete production process, each in-process control check is completed in less than 18 minutes (Figure 3), enabling the comparison of real-time data during the production of your gene therapy or vaccine product; saving time and expensive wastage. In addition, CIMac pDNA Analytical Column enables the separation of all three pDNA conformations (Figure 4) and is able to monitor the removal of other impurities such as RNA. CIMac pDNA Analytical Column allows quality control to ensure that each batch has the highest level of supercoiled pDNA and the minimum amount of impurities in real time to ensure an efficient and cost-effective gene therapy/vaccine production run. Boštjan Gabor; Urh Cernigoj, PhD; and Franci Smrekar are researchers in the applications laboratory at BIA Separations, Teslova 30, SI-1000 Ljubljana, Slovenia, 386-1-426-5649; bostjan.gabor@monoliths.com; urh.cernigoj@monoliths.com; franci.smrekar@monoliths.com; www.biaseparations.com.